SHIPPING: The standard shipping/handling charge is for Continental USA ground shipment. For other destinations or methods of shipment, we will send you an invoice for the additional charges when we receive your order. For information about shipping/handling charges, please send email. Returns Policy: 15% restocking fee on 15-day returns in the original package. We do not refund shipping charges. Browse for other maps in the Map Menu. ATTENTION: This map is intended for classrooms, so, it is NOT a detailed map. 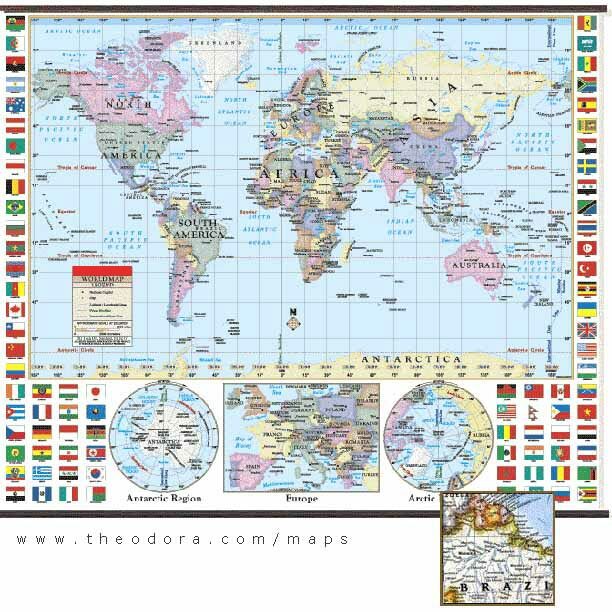 You can order the more detailed World Map 74" x 53" (188cm X 135cm) or the Giant World Map 108" x 78" (2.75m x 2m) from the MAP MENU. Made in the USA, printed in full color on durable, laminated material that can be written on with non-permanent markers and wiped clean. Great for home or office use. The map includes physical features, political boundaries, national capitals, cities, major waterways and longditude/latitude lines. The bottom of this map has separate maps of the polar regions and a closeup map of Europe. The margins contain images of the flags of all countries. These are top quality maps. Attention: If you wish to have the map shipped outside of the continental USA, or a method of shipment other than ground in US, please let us know in the comments section during checkout, and we will send you an invoice for the additional shipping/handling charges. See MENU of other wall maps. Shipping Terms: Buyer pays. Will ship internationally. Customer Service Policy: 15% restocking fee on unused items returned within 15 days. Shipping/handling charges not refundable. Made to order items are not returnable.